Were Hindu Gods none other than Ancient Aliens? Read our post “Are We alone? Are UFOs real? “. Further read our “Disclaimer” before you read this post. There are about 200 billion stars in our milky way galaxy and there are about 100 billion galaxies. Hence if we think we are alone in the Universe, it is an awful waste of space!!! Human race is arrogant of its own existence and take it for granted that we are at the pinnacle of any type of evolution. Hence there is every possibility of advanced life in our universe who can be many years technologically superior to us. Imagine we going to our early man era with our hi tech weapons, food, flying craft, and other gizmos, we will be treated as “Gods” by our ancestors because of the things we can do. In my opinion, God is The One who is omnipresent, omnipotent, omniscient, creator of our Universe and The One who does not need vehicles to travel from point A to point B and The One who does not need weapons for destroying mankind. Ancient Alien proponents suggest that ETs (Extra Terrestrial) not only visited Earth but have stayed on Earth and helped shape the future of Earth. Ever imagined, why we look up at the sky when we talk or think about God? According to Dr.V. Raghavan, retired head of the Sanskrit department of India’s prestigious University of Madras, centuries-old documents in Sanskrit (the classical language of India and Hinduism) prove that aliens from outer space visited India. 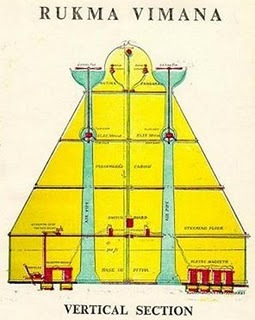 There is a just a mass of fascinating information about flying machines, even fantastic science fiction weapons, that can be found in translations of the Vedas (scriptures), Indian epics, and other ancient Sanskrit text. “In the Mahabharata (writings), there is notion of divine lighting and ray weapons, even a kind of hypnotic weapon. In the Ramayana (writings), there is a description of Vimanas, or flying machines, which navigated at great heights with the aid of quicksilver and a great propulsive wind. “These were space vehicles similar to the so-called flying saucers reported throughout the world today. Sanskrit texts are filled with references to Gods who fought battles in the sky using Vihmanas equipped with weapons as deadly as any we can deploy in these more enlightened times. “Propulsion was based on a combination of electrical, chemical, and solar energy”. Clearly, these descriptions relate to a craft of alien origin. “The Vimana was metallic, had lights and was capable of fantastic speed”. Sixteen different types of heat-absorbing alloys that went into construction of the Vimana were also described. “These texts describe how Indra, the god of war, flew about in a Vimana – best translated as an aerial car”. How did ancient people know how to fly at light speeds when flying was a reality to earthlings only in recent times (forget about traveling at light speed)? Could be our ancestors saw these flying vehicles and interpreted them as humongous birds carrying Gods, because to them anything that flies has to be a bird? In the Ramayan and Mahabharat Serials, we saw the vimanahs as flying horse driven Chariots / large birds. The descriptions of Vimanas given in Sanskrit texts are strikingly similar to the modern UFO sightings reported all over the world. 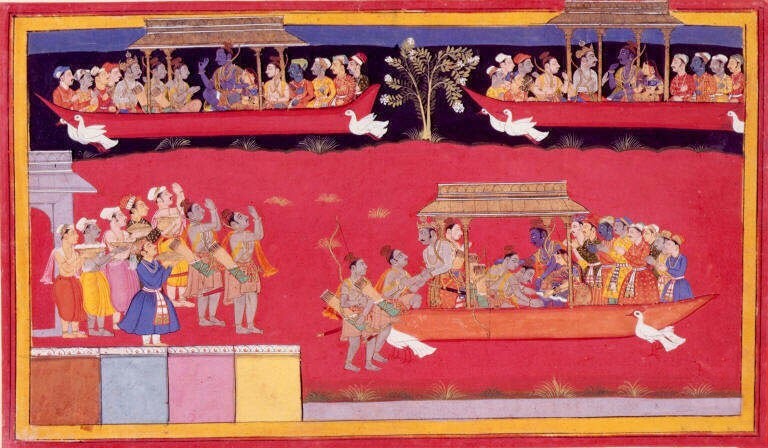 In the Sanskrit texts, an exact depiction of the Vimanah is reproduced here. One such dreaded weapon is the Brahmastra. It is akin to our present nuclear weapon. According to our Sanskrit texts, “This weapon also causes severe environmental damage. The land where the weapon is used becomes barren for eons and all life in and around that area ceases to exist. Women and men become infertile. There is severe decrease in rainfall and the land develops cracks like in a drought.” How could our ancestors have knowledge of nuclear and other such weapons, when the nuclear weapon is known to man only in recent times? High radiation caused due to nuclear activity is still recorded in Mohenjodara and Harappa ruins. Could be our ancestors saw the use of these weapons by “Gods” and misinterpreted these hi tech missiles to be bows and arrows spewing fire, wind, etc, because that’s all they knew about weapons? The DNA of living things is an astounding thing to know about. We know only 5% of Human DNA. Could be the Extra Terrestrials had studied our DNA and knew how to mutate it? Hence in our ancient texts, we see extra-ordinary beings half human, half animal, or having the head of any animal or having more than one head and two arms etc. It is also believed by Ancient Astronaut proponents that ETs conducted Frankenstein-like experiments on Human DNA to create extraordinary beings. Many such experiments were also carried out in other parts of the world like Egypt, Mesopotamia, Maya, Inca, Aztec civilisations. We know from our Sanskrit texts that Hindu Gods have eternal life. Some of The Gods came back to Earth as reincarnations. Well here could be the reason, scientifically!! Applying the Theory of Relativity by Albert Einstein, if u travel at speed equal to speed of light then time you lived will be lesser than others. (It means if you travel for 1 day on that kind of speed, when you reach back you find others become older than you). Speed of light is approximately 300,000 kms / second. So it could be that, our God, who could be an ET, travelled to his planet outside our Solar system, say orbiting the star Sirius, for a one year holiday, and came back to Earth, the Earthlings will be older by say, 500 years!!! Well, there is no dearth in making deductive reasoning on the subject. Its never ending and you might think, “What about this? And what about that?”. It’s no surprise that information like this will rock the cradle for the mass fragile minds that can’t think outside the box if their life depended on it. Did ancient aliens really help to shape our history? Remember. Our technology is relatively primitive. Earth is only 4 billion years old. There are planets out there billions of years older. Just imagine the kind of technology that these planet inhabitants may be having. THINK, DRAWING CORRELATIONS. DEDUCTIVE REASONING IS NOT A BAD PRACTICE! Recommended watch is History Channels ‘Ancient Aliens – The Series’ documentary.